It has an adjustable exposure timer. Set time, insert ID card and press the exposure plate. Ideal as a testing device for exposure and developing procedures. Dimensions: 3" H x 8" W x 8" D. Power: 110/120 AC or DC. Approx. shipping weight 6 Lbs. Just insert the film and ID card, hold down exposure plate, and release when the light goes on. Light intensity is adjusted by a switch. Specifications for both units: dimensions: 3" H x 8" W x 8" D. Power: 110/120 AC or DC. Approx. shipping weight 6 Lbs. Standard print: (style A) Cat. 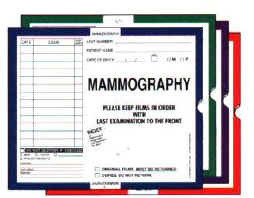 No.ID-185 non-personalized printed with blanks for patient’s name, age, date & No. Protect your radiographs with this full line of negative preservers. Ruled spaces for identification are preprinted on heavy duty Kraft paper. An offset thum-bcut for easy opening is featured on most items. Brown Kraft is our standard stock color, red, green & Gray also available. String & button fasteners and chipboard inserts assures safe mailing of film third or fourth class. Preprinted heavy duty Brown Kraft with string & button. 35% post-consumer recycled content. Reinforced handle. 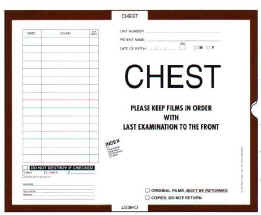 Accommodates standard x-ray film jackets. Attached lid with tab closure. Box/wall construction (end-side-bottom): 2 ply x 1 ply x 1 ply. Heavy duty strength. 200 lb. test weight. Inside dimensions listed below (w x h x d). Carton of 6. White.